John Hammergren, Chairman, President & CEO, McKesson Corporation Though the healthcare industry moves to a new direction by embracing latest technology to provide value-based care, many healthcare institutions lack the right IT systems to manage patient population. Recent survey at the annual Healthcare Information and Management Systems Society (HIMSS) conference suggests that only 38 percent of U.S. hospitals and health systems utilize population health tools in their operations. In the past, technology in healthcare has mostly been about innovation around device and pharmaceutical. Whereas, the care delivery process has seen lesser innovation,” reveals John Hammergren, Chairman, President and CEO, McKesson Corporation [NYSE:MCK]. Against the backdrop of the growing patient population and bombardment of solutions and growth of advanced IT tools, healthcare community is struggling to strike a balance. Meanwhile, patients, employers, and payers are expecting more returns on their expenditure on healthcare. Driven by this pressure, care providers have directed their investments toward platforms that optimize clinical quality as well as aid them to undertake risk-based contracts. The remedy here is to dive deep into the arena of population health. McKesson Corporation, known as a coryphaeus in the healthcare services and information technology domain, is dedicated to deliver innovative solutions built from the ground up. Hammergren, with his vision and acumen on healthcare sector, has been instrumental in driving McKesson to be one of largest healthcare service companies. Under his leadership, the company has ruled the roost in the healthcare spectrum devising unique techniques that help performance and care delivery with the use of effective IT solutions. McKesson Population Manager is deft in providing insight and visibility into the health of patient populations, helping provider networks achieve better health outcomes. This solution also serves as a powerful network platform for clinical integration and accountable care programs that are developed through an intensive collaboration with physicians, pharmacists, business and IT experts. The software supports risk-based contracting, where payers reward provider groups for better healthcare quality and cost-effective delivery, thereby allowing physicians to achieve positive results and better population health management. 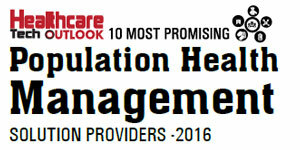 The McKesson Population Manager also helps organizations to achieve better preventive care and disease management, improve physician compliance with quality measures and care guidelines—Healthcare Effectiveness Data and Information Set (HEDIS), Integrated Healthcare Association (IHA) and Physician Quality Reporting System (PQRS}. Additionally, the solution clinically integrates providers’ network to enable contract negotiation and generates PQRS reports on care quality for Centers for Medicare and Medicaid Services (CMS), streamlining workflow and patient outreach. The powerful clinical integration tool drives improvements in the quality of care of provider groups, helping them achieve desired results. Unlike disease registries, which only provide a simple listing of patients with a common disease, the McKesson Population Manager offers clinical intelligence to help improve care and compliance with evidencebased clinical guidelines. Embedded algorithms for both preventive care and chronic conditions help healthcare providers to identify patients who are in need of care and guide them with clinical and patient behavior to foster care improvements. The Population Manager also aggregates data from Electronic Health Records (EHRs), practice management systems, pharmacies, labs, and patient registries for common diseases to help manage populations and promote evidencebased care. This is followed by procedures like tracking individual patients and getting data on clinical events and lab results. The solution’s automated workflow seamlessly help utilize compliance reports to identify patients who need screenings or other care to coordinate and close gaps that exist within the healthcare set up. The reports also alert physician when a patient is due for care. Additionally, the solution has a predictive model that helps in identifying high risk patients for hospitalization and its costs to inform a more intensive care management approach. The McKesson Population Health Management software groups patients by demographics or disease conditions. This is followed by providing actionable details through its registries to help organizations track individual patient and identify population with gaps in care. This helps drill-down to patient data on clinical events and lab results. The solution also enables easy communication with patients about the right time to see the doctor and give them patient-specific reminders and care guidance prior to each appointment. In addition, it integrates exception reporting, and supports the tracking of patients who refuse care or aren't eligible for a specific guideline. "Our solutions provide the tools, expertise, and also support provider networks and payer’s needs at every step of the way of the population health transition and beyond"
Further, McKesson’s registries allow organizations get the specific data needed and sort and group patients based on the disease, condition, guideline, and/or payer. It even reports to optimize patient care and group performance, providing the necessary data to promote desired physician behaviors. McKesson Population Health Management software supports a system of community connectivity to help physician groups identify opportunities and follow through for better quality of care. This approach is an effective and positive way to promote guideline compliance for clinical integration. McKesson Risk Manager provides actionable clinical and financial intelligence to providers taking on risk-based contracts. The solution also offers powerful patient risk identification and stratification, NCQA-certified quality gaps-in-care identification, patient outreach, HEDIS and IHA quality-measure compliance and provider episodic analysis, network leakage and more. McKesson Care Manager is a care management solution built for the realities of today’s provider-oriented world and the variable complexity of patient needs. Using a holistic, patient-centric approach and blended evidence-based care plans, the solution helps care managers affect patient behavior to improve quality of life and optimize outcomes. “McKesson has been around for 185 years, and the only way we have been this long is our constant evolution on behalf of our customers to make them successful in the clinical and financial dimension as well as grab a hold of the challenges,” states Hammergren. Driven by the ideology of having the courage to make difficult decisions and driving what it takes to help customers succeed, McKesson is all set to disrupt the healthcare space with its best-of-the-breed solutions. “Whether you’re talking about a person or a company, leadership is about values. Values are the foundation for leadership, and the job of leadership is to create the conditions that allow strong values to thrive,” concludes Hammergren.